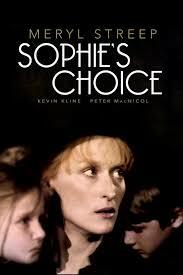 In the movie, Sophie's Choice, Sophie had to decide which child would go with her to the concentration camp and which child would die during the Holocaust. I was never able to watch the entire move but thankfully through the magic of the internet, I found out who she chose: her son over her daughter. As hideous as this may sound, Sophie at the very least had a choice. Of course, this choice haunted her for the rest of her life. However, up until today, none of the families trying to seek asylum in the United States given a choice. They watch as their children are ripped from their arms and placed in cages in detention centers. According to news reports, little care or attention is given to these children. Some were babies. How did we get to this point? More importantly, when did the Bible become the blueprint for evil? What's next: the US gets into human trafficking of children? As we know, Jeff Sessions justified this action by quoting Romans 13. It is unfortunate that Mr. Sessions doesn't understand the Bible or God for that matter. In Romans 13, St. Paul says that if we disobey God then it's akin to disobeying the government's law: there are consequences to misusing free will. God doesn't say anything about rubber stamping a government's supreme authority over its populace. Otherwise, Hitler would have been correct in his dictatorship and genocide. Hitler did NOT have God on his side nor would God have condoned genocide. I doubt very much that God approves what Trump's administration is doing. I've never in my life witnessed such cruelty to children by my government. The US Government is not "nice" to it's citizens on occasion (the Patriot Act and the NSA comes to mind) but they've never deliberately tried to separate children from their parents in a cruel and sadistic way. Twice in Romans chapter 13 St. Paul says that "love has fulfilled the law." The love he is referring to is Jesus Christ. Jesus Christ's love is so great for us that He condescended to our level (became Human) and died for us. He never had to do that. So why would we disobey God's love? He gave up everything for us. It's too bad Mr. Sessions didn't read the entire chapter and doesn't really understand what he is reading. Had Mr. Sessions done so, he would have interpreted Romans 13 differently. St. Paul is exhorting the Romans to obey the Word of God as they should obey the law of the state. Jesus Christ promised us eternal life. Life is no longer finite. Life is living for God, with God, and striving to be God-like. Separating a child from his/her parents is wrong and against God. It is an act so horrible that no child should have to experience this trauma. Trump wants to build his wall so he is using children as bargaining chips. Rather than Mr. Sessions leveraging his position as Attorney General to stop this travesty, he's decided to blaspheme the Bible. He's using it to justify his boss' agenda (Trump) and those children be damned. In Matthew 19:13, Jesus Christ says: “'Let the children come to me, and do not hinder them; for to such belongs the kingdom of heaven.'" In other words, Jesus Christ would never separate children from their parents at the border. He would take all those families into His arms and love them because His "...love is the fulfilling of the law." It's a pity that Mr. Sessions never gave those parents a choice. In a very twisted way, Sophie had a better option.